Teeworlds is a fast-paced 2D sidescrolling shooter. 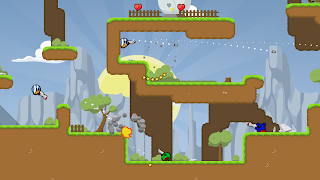 The players may look like Kirbies, but this game is full of shooting and explosions. It has three game modes (CTF, Deathmatch, and Team Deathmatch), and players can make their own maps. The online scene is active, with plenty of servers available, and the game itself is actively maintained.